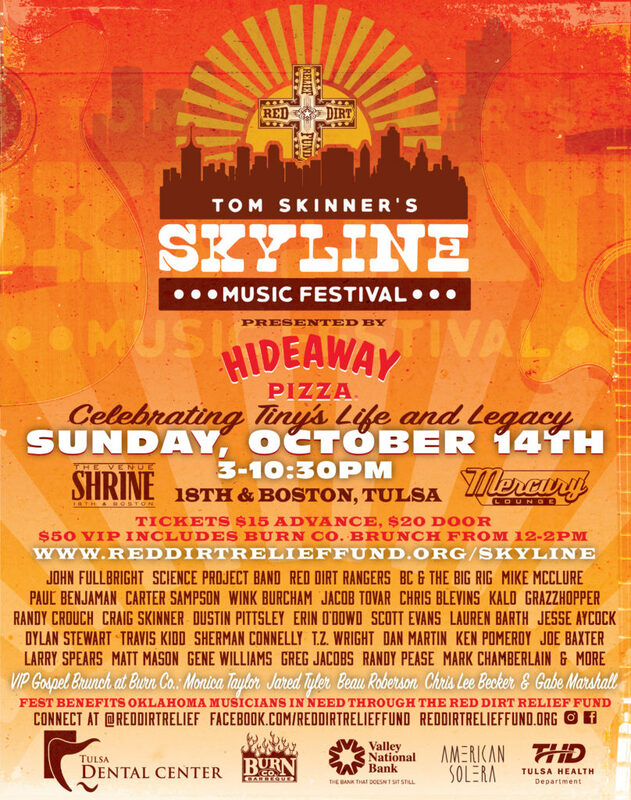 John is pleased and excited to play at the 3rd Annual Tom Skinner’s Skyline Music Festival at the Venue Shrine in Tulsa, Oklahoma on October 14. Tulsa, Okla.— When the Tom Skinner Skyline Music Festival returns to Tulsa’s SoBo neighborhood (18th & Boston) on Sunday, October 14th, more than 45 musicians on the lineup will have access to free flu shots, health and dental screenings. Additionally, all proceeds of the festival organized by the nonprofit Red Dirt Relief Fund will support their mission to provide a safety net of critical assistance to Oklahoma music people. Tulsa Health Department’s Working for Balance dieticians will be on site during the festival to perform blood pressure and blood sugar testing as well as provide nutrition educational information. Tulsa Health Department staff will also provide free flu shots to musicians playing the festival. Dr. Joanna Roulston of Tulsa Dental Center will provide basic dental screenings, and has created a Red Dirt Relief Fund musician dental discount plan for recommended treatment and regular maintenance in the future. All services will be provided free of charge on a first-come, first-served basis from 3:00pm-5:00pm. Since 2012, Red Dirt Relief Fund has granted more than $100,000 to 51 musicians across 15 Oklahoma cities and towns helping them get back to work making music after emergency surgeries, cancer treatment, accidents, house fire and damage from tornado and earthquake, premature childbirths, debilitating car wrecks and even rehabilitation from drug addiction. 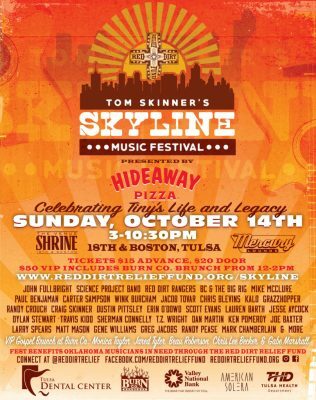 Presented by Hideaway Pizza, Tom Skinner Skyline Festival features acoustic and full band performances from more than 45 Oklahoma musicians across two venues: Venue Shrine and Mercury Lounge. Last year the festival raised $5,213 to aid Oklahoma musicians. The 2018 all-Oklahoma lineup includes standouts like Grammy-nominated John Fullbright, Paul Benjaman, Red Dirt Rangers, Tom Skinner’s Science Project Band, BC & the Big Rig and more. Ten of the musicians on the lineup have benefitted from a Red Dirt Relief Fund grant. Tickets and more festival information can be found at reddirtrelieffund.org/skyline. Advance general admission tickets that allow access to both venues are $15, or $20 at the door. A limited number of VIP tickets that include festival admission and a Gospel Brunch at Burn Co. are available for $50. Additional benefits are available by purchasing “Friend of the Festival” packages including VIP tickets, T-shirts and autographed posters. For more information, interview or media credential requests, contact Red Dirt Relief Fund Executive Director Katie Dale at 918-407-4599 or reddirtreliefffund@gmail.com. An event to benefit Oklahoma artists, statewide.